1. Excessive drooling. This could be just a sign that your cat has something stuck in its mouth or throat, or it could mean that it’s sick. 2. Vomiting. Cat vomiting causes range from bad food to serious stomach illness. 3. Lethargy. If your cat seems to be moving more slowly or drifting off more often than usual, it’s worth taking a trip to the vet to find out what’s the matter. 4. Recent animal bite or scratch. FIV in cats, among other diseases, is spread namely through bite or scratch wounds. 5. Litter box accidents. If your cat is well trained, but suddenly begins having accidents outside of the litter box, it could be a sign that something is wrong. 6. Meowing in pain. 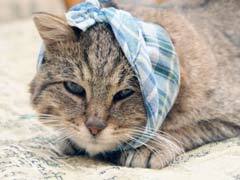 This is one of the most obvious sick cat symptoms. If your cat is clearly complaining of pain that you cannot find the source of, take it in to the vet. 7. Loss of appetite. This can be a sign that your pet is sick and, if left unattended to, can lead to rapid weight loss, another sign of a sick cat. 8. Problems with urination. This symptom can range from blood in the urine to your cat not being able to pass urine at all. 9. Erratic behavior. Many times, sick cats just don’t quite act like themselves. Cat health insurance covers even those visits where you just feel something is wrong. 10. Changes in coat. If your cat is losing its hair for no apparent reason, or you notice its coat looking dull and lackluster, it could be due to sickness. There are some very common cat illness symptoms to look for when determining just how serious your pet’s situation is. It’s important to know what sick cat symptoms to look for so that you know when to worry and when to disregard little Tabby’s odd behaviors as simply a bad day.